These highlights do not include all the information needed to use AMLODIPINE BESYLATE TABLETS safely and effectively. See full prescribing information for AMLODIPINE BESYLATE TABLETS . Amlodipine besylate tablets are indicated for the treatment of hypertension, to lower blood pressure. Lowering blood pressure reduces the risk of fatal and nonfatal cardiovascular events, primarily strokes and myocardial infarctions. Amlodipine besylate tablets are indicated for the treatment of hypertension, to lower blood pressure. Lowering blood pressure reduces the risk of fatal and nonfatal cardiovascular events, primarily strokes and myocardial infarctions. These benefits have been seen in controlled trials of antihypertensive drugs from a wide variety of pharmacologic classes including amlodipine besylate tablets. Control of high blood pressure should be part of comprehensive cardiovascular risk management, including, as appropriate, lipid control, diabetes management, antithrombotic therapy, smoking cessation, exercise and limited sodium intake. Many patients will require more than one drug to achieve blood pressure goals. For specific advice on goals and management, see published guidelines, such as those of the National High Blood Pressure Education Program’s Joint National Committee on Prevention, Detection, Evaluation and Treatment of High Blood Pressure (JNC). Amlodipine besylate tablets may be used alone or in combination with other antihypertensive agents. In patients with recently documented CAD by angiography and without heart failure or an ejection fraction <40%, amlodipine besylate tablets are indicated to reduce the risk of hospitalization for angina and to reduce the risk of a coronary revascularization procedure. Worsening angina and acute myocardial infarction can develop after starting or increasing the dose of amlodipine besylate, particularly in patients with severe obstructive coronary artery disease. Because amlodipine besylate is extensively metabolized by the liver and the plasma elimination half-life (t 1/2) is 56 hours in patients with impaired hepatic function, titrate slowly when administering amlodipine besylate to patients with severe hepatic impairment. Amlodipine besylate therapy has not been associated with clinically significant changes in routine laboratory tests. No clinically relevant changes were noted in serum potassium, serum glucose, total triglycerides, total cholesterol, HDL cholesterol, uric acid, blood urea nitrogen, or creatinine. Amlodipine besylate has been used safely in patients with chronic obstructive pulmonary disease, well-compensated congestive heart failure, coronary artery disease, peripheral vascular disease, diabetes mellitus and abnormal lipid profiles. The limited available data based on post-marketing reports with amlodipine besylate use in pregnant women are not sufficient to inform a drug-associated risk for major birth defects and miscarriage. There are risks to the mother and fetus associated with poorly controlled hypertension in pregnancy [see Clinical Considerations]. In animal reproduction studies, there was no evidence of adverse developmental effects when pregnant rats and rabbits were treated orally with amlodipine maleate during organogenesis at doses approximately 10 and 20-times the maximum recommended human dose (MRHD), respectively. However for rats, litter size was significantly decreased (by about 50%) and the number of intrauterine deaths was significantly increased (about 5-fold). Amlodipine has been shown to prolong both the gestation period and the duration of labor in rats at this dose [see Data]. No evidence of teratogenicity or other embryo/fetal toxicity was found when pregnant rats and rabbits were treated orally with amlodipine maleate at doses up to 10 mg amlodipine/kg/day ( approximately 10 and 20 times the MRHD based on body surface area, respectively) during their respective periods of major organogenesis. However for rats, litter size was significantly decreased (by about 50%) and the number of intrauterine deaths was significantly increased (about 5-fold) in rats receiving amlodipine maleate at a dose equivalent to 10 mg amlodipine/kg/day for 14 days before mating and throughout mating and gestation. 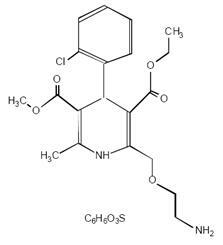 Amlodipine maleate has been shown to prolong both the gestation period and the duration of labor in rats at this dose. Amlodipine besylate (2.5 to 5 mg daily) is effective in lowering blood pressure in patients 6 to 17 years [see Clinical Studies (14.1)]. Effect of amlodipine besylate on blood pressure in patients less than 6 years of age is not known. Clinical studies of amlodipine besylate did not include sufficient numbers of subjects aged 65 and over to determine whether they respond differently from younger subjects. Other reported clinical experience has not identified differences in responses between the elderly and younger patients. In general, dose selection for an elderly patient should be cautious, usually starting at the low end of the dosing range, reflecting the greater frequency of decreased hepatic, renal, or cardiac function, and of concomitant disease or other drug therapy. Elderly patients have decreased clearance of amlodipine with a resulting increase of AUC of approximately 40% to 60%, and a lower initial dose may be required [see Dosage and Administration (2.1)]. Overdosage might be expected to cause excessive peripheral vasodilation with marked hypotension and possibly a reflex tachycardia. In humans, experience with intentional overdosage of amlodipine besylate is limited. If massive overdose should occur, initiate active cardiac and respiratory monitoring. Frequent blood pressure measurements are essential. Should hypotension occur, provide cardiovascular support including elevation of the extremities and the judicious administration of fluids. If hypotension remains unresponsive to these conservative measures, consider administration of vasopressors (such as phenylephrine) with attention to circulating volume and urine output. As amlodipine besylate is highly protein bound, hemodialysis is not likely to be of benefit. Amlodipine besylate, USP is a white crystalline powder with a molecular weight of 567.1. It is slightly soluble in water and sparingly soluble in ethanol. Amlodipine besylate tablets, USP are formulated as white tablets equivalent to 2.5, 5 and 10 mg of amlodipine for oral administration. In addition to the active ingredient, amlodipine besylate, USP, each tablet contains the following inactive ingredients: dibasic calcium phosphate anhydrous, magnesium stearate, microcrystalline cellulose and sodium starch glycolate. Exertional Angina: In patients with exertional angina, amlodipine besylate reduces the total peripheral resistance (afterload) against which the heart works and reduces the rate pressure product, and thus myocardial oxygen demand, at any given level of exercise. Vasospastic Angina: Amlodipine besylate has been demonstrated to block constriction and restore blood flow in coronary arteries and arterioles in response to calcium, potassium epinephrine, serotonin and thromboxane A2 analog in experimental animal models and in human coronary vessels in vitro. This inhibition of coronary spasm is responsible for the effectiveness of amlodipine besylate in vasospastic (Prinzmetal's or variant) angina. Hemodynamics: Following administration of therapeutic doses to patients with hypertension, amlodipine besylate produces vasodilation resulting in a reduction of supine and standing blood pressures. These decreases in blood pressure are not accompanied by a significant change in heart rate or plasma catecholamine levels with chronic dosing. 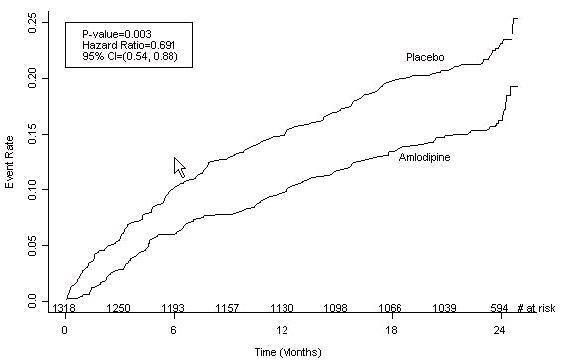 Although the acute intravenous administration of amlodipine decreases arterial blood pressure and increases heart rate in hemodynamic studies of patients with chronic stable angina, chronic oral administration of amlodipine in clinical trials did not lead to clinically significant changes in heart rate or blood pressures in normotensive patients with angina. With chronic once daily oral administration, antihypertensive effectiveness is maintained for at least 24 hours. Plasma concentrations correlate with effect in both young and elderly patients. The magnitude of reduction in blood pressure with amlodipine is also correlated with the height of pretreatment elevation; thus, individuals with moderate hypertension (diastolic pressure 105 to 114 mmHg) had about a 50% greater response than patients with mild hypertension (diastolic pressure 90 to 104 mmHg). Normotensive subjects experienced no clinically significant change in blood pressures (+1/–2 mmHg). In hypertensive patients with normal renal function, therapeutic doses of amlodipine besylate resulted in a decrease in renal vascular resistance and an increase in glomerular filtration rate and effective renal plasma flow without change in filtration fraction or proteinuria. As with other calcium channel blockers, hemodynamic measurements of cardiac function at rest and during exercise (or pacing) in patients with normal ventricular function treated with amlodipine besylate have generally demonstrated a small increase in cardiac index without significant influence on dP/dt or on left ventricular end diastolic pressure or volume. In hemodynamic studies, amlodipine besylate has not been associated with a negative inotropic effect when administered in the therapeutic dose range to intact animals and man, even when co-administered with beta-blockers to man. Similar findings, however, have been observed in normal or well-compensated patients with heart failure with agents possessing significant negative inotropic effects. Electrophysiologic Effects: Amlodipine besylate does not change sinoatrial nodal function or atrioventricular conduction in intact animals or man. In patients with chronic stable angina, intravenous administration of 10 mg did not significantly alter A-H and H-V conduction and sinus node recovery time after pacing. Similar results were obtained in patients receiving amlodipine besylate and concomitant beta-blockers. In clinical studies in which amlodipine besylate were administered in combination with beta-blockers to patients with either hypertension or angina, no adverse effects on electrocardiographic parameters were observed. In clinical trials with angina patients alone, amlodipine besylate therapy did not alter electrocardiographic intervals or produce higher degrees of AV blocks. After oral administration of therapeutic doses of amlodipine besylate, absorption produces peak plasma concentrations between 6 and 12 hours. Absolute bioavailability has been estimated to be between 64% and 90%. The bioavailability of amlodipine besylate is not altered by the presence of food. Elderly patients and patients with hepatic insufficiency have decreased clearance of amlodipine with a resulting increase in AUC of approximately 40% to 60%, and a lower initial dose may be required. A similar increase in AUC was observed in patients with moderate to severe heart failure. Amlodipine is a weak inhibitor of CYP3A and may increase exposure to CYP3A substracts. Tacrolimus: A prospective study in healthy Chinese volunteers (N=9) with CYP3A5 expressers showed a 2.5-to 4-fold increase in tacrolimus exposure when concomitantly administered with amlodipine compared to tacrolimus alone. This finding was not observed in CYP3A5 non-expressers (N= 6). However, a 3-fold increase in plasma exposure to tacrolimus in a renal transplant patient (CYP3A5 non-expresser) upon initiation of amlodipine for the treatment of post-transplant hypertension resulting in reduction of tacrolimus dose has been reported. Irrespective of the CYP3A5 genotype status, the possibility of an interaction cannot be excluded with these drugs [see Drug Interactions (7.2)]. Sixty-two hypertensive patients aged 6 to 17 years received doses of amlodipine besylate between 1.25 mg and 20 mg. Weight-adjusted clearance and volume of distribution were similar to values in adults. The antihypertensive efficacy of amlodipine besylate has been demonstrated in a total of 15 double-blind, placebo-controlled, randomized studies involving 800 patients on amlodipine besylate and 538 on placebo. Once daily administration produced statistically significant placebo-corrected reductions in supine and standing blood pressures at 24 hours postdose, averaging about 12/6 mmHg in the standing position and 13/7 mmHg in the supine position in patients with mild to moderate hypertension. Maintenance of the blood pressure effect over the 24-hour dosing interval was observed, with little difference in peak and trough effect. Tolerance was not demonstrated in patients studied for up to 1 year. The 3 parallel, fixed dose, dose response studies showed that the reduction in supine and standing blood pressures was dose-related within the recommended dosing range. Effects on diastolic pressure were similar in young and older patients. The effect on systolic pressure was greater in older patients, perhaps because of greater baseline systolic pressure. Effects were similar in black patients and in white patients. Two hundred sixty-eight hypertensive patients aged 6 to 17 years were randomized first to amlodipine besylate 2.5 or 5 mg once daily for 4 weeks and then randomized again to the same dose or to placebo for another 4 weeks. Patients receiving 2.5 mg or 5 mg at the end of 8 weeks had significantly lower systolic blood pressure than those secondarily randomized to placebo. The magnitude of the treatment effect is difficult to interpret, but it is probably less than 5 mmHg systolic on the 5 mg dose and 3.3 mmHg systolic on the 2.5 mg dose. Adverse events were similar to those seen in adults. The effectiveness of 5 to 10 mg/day of amlodipine besylate in exercise-induced angina has been evaluated in 8 placebo-controlled, double-blind clinical trials of up to 6 weeks duration involving 1038 patients (684 amlodipine besylate, 354 placebo) with chronic stable angina. In 5 of the 8 studies, significant increases in exercise time (bicycle or treadmill) were seen with the 10 mg dose. Increases in symptom-limited exercise time averaged 12.8% (63 sec) for amlodipine besylate 10 mg, and averaged 7.9% (38 sec) for amlodipine besylate 5 mg. Amlodipine besylate 10 mg also increased time to 1 mm ST segment deviation in several studies and decreased angina attack rate. The sustained efficacy of amlodipine besylate in angina patients has been demonstrated over long-term dosing. In patients with angina, there were no clinically significant reductions in blood pressures (4/1 mmHg) or changes in heart rate (+0.3 bpm). In a double-blind, placebo-controlled clinical trial of 4 weeks duration in 50 patients, amlodipine besylate therapy decreased attacks by approximately 4/week compared with a placebo decrease of approximately 1/week (p<0.01). Two of 23 amlodipine besylate and 7 of 27 placebo patients discontinued from the study due to lack of clinical improvement. 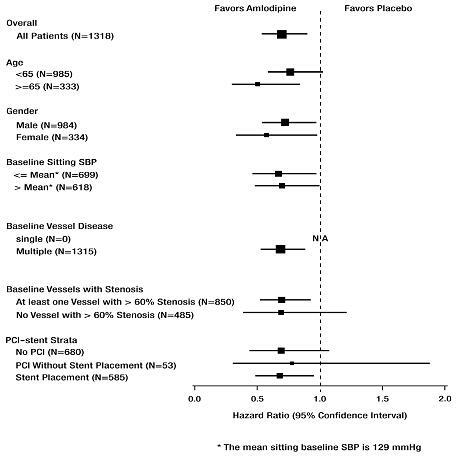 In PREVENT, 825 patients with angiographically documented coronary artery disease were randomized to amlodipine besylate (5 to 10 mg once daily) or placebo and followed for 3 years. Although the study did not show significance on the primary objective of change in coronary luminal diameter as assessed by quantitative coronary angiography, the data suggested a favorable outcome with respect to fewer hospitalizations for angina and revascularization procedures in patients with CAD. CAMELOT enrolled 1318 patients with CAD recently documented by angiography, without left main coronary disease and without heart failure or an ejection fraction <40%. Patients (76% males, 89% Caucasian, 93% enrolled at U.S. sites, 89% with a history of angina, 52% without PCI, 4% with PCI and no stent, and 44% with a stent) were randomized to double-blind treatment with either amlodipine besylate (5 to 10 mg once daily) or placebo in addition to standard care that included aspirin (89%), statins (83%), beta-blockers (74%), nitroglycerin (50%), anticoagulants (40%) and diuretics (32%), but excluded other calcium channel blockers. The mean duration of follow-up was 19 months. The primary endpoint was the time to first occurrence of one of the following events: hospitalization for angina pectoris, coronary revascularization, myocardial infarction, cardiovascular death, resuscitated cardiac arrest, hospitalization for heart failure, stroke/TIA, or peripheral vascular disease. A total of 110 (16.6%) and 151 (23.1%) first events occurred in the amlodipine besylate and placebo groups, respectively, for a hazard ratio of 0.691 (95% CI: 0.540–0.884, p = 0.003). The primary endpoint is summarized in Figure 1 below. The outcome of this study was largely derived from the prevention of hospitalizations for angina and the prevention of revascularization procedures (see Table 1). Effects in various subgroups are shown in Figure 2. Table 1 below summarizes the significant composite endpoint and clinical outcomes from the composites of the primary endpoint. The other components of the primary endpoint including cardiovascular death, resuscitated cardiac arrest, myocardial infarction, hospitalization for heart failure, stroke/TIA, or peripheral vascular disease did not demonstrate a significant difference between amlodipine besylate and placebo. Amlodipine besylate has been compared to placebo in four 8 to 12 week studies of patients with NYHA Class II/III heart failure, involving a total of 697 patients. In these studies, there was no evidence of worsened heart failure based on measures of exercise tolerance, NYHA classification, symptoms, or left ventricular ejection fraction. In a long-term (follow-up at least 6 months, mean 13.8 months) placebo-controlled mortality/morbidity study of amlodipine besylate 5 to 10 mg in 1153 patients with NYHA Classes III (n=931) or IV (n=222) heart failure on stable doses of diuretics, digoxin, and ACE inhibitors, amlodipine besylate had no effect on the primary endpoint of the study which was the combined endpoint of all-cause mortality and cardiac morbidity (as defined by life-threatening arrhythmia, acute myocardial infarction, or hospitalization for worsened heart failure), or on NYHA classification, or symptoms of heart failure. Total combined all-cause mortality and cardiac morbidity events were 222/571 (39%) for patients on amlodipine besylate and 246/583 (42%) for patients on placebo; the cardiac morbid events represented about 25% of the endpoints in the study. Another study (PRAISE-2) randomized patients with NYHA Class III (80%) or IV (20%) heart failure without clinical symptoms or objective evidence of underlying ischemic disease, on stable doses of ACE inhibitors (99%), digitalis (99%) and diuretics (99%), to placebo (n=827) or amlodipine besylate (n=827) and followed them for a mean of 33 months. There was no statistically significant difference between amlodipine besylate and placebo in the primary endpoint of all-cause mortality (95% confidence limits from 8% reduction to 29% increase on amlodipine besylate). With amlodipine besylate there were more reports of pulmonary edema. Amlodipine Besylate Tablets, USP, 2.5 mg (amlodipine besylate equivalent to 2.5 mg of amlodipine per tablet) are supplied as white, round, flat, beveled edged tablets debossed “IP 6” on obverse and plain on reverse. Store at 20° to 25°C (68° to 77°F); excursions permitted between 15° to 30°C (59° to 86°F) [see USP Controlled Room Temperature]. Dispense in tight, light-resistant containers as defined in the USP. Read this information carefully before you start taking amlodipine besylate and each time you refill your prescription. There may be new information. This information does not replace talking with your doctor. If you have any questions about amlodipine besylate, ask your doctor. Your doctor will know if amlodipine besylate is right for you. Do not use amlodipine besylate tablets if you are allergic to amlodipine (the active ingredient in amlodipine besylate tablets), or to the inactive ingredients. Your doctor or pharmacist can give you a list of these ingredients. are breast-feeding. Amlodipine besylate passes into your milk. Take amlodipine besylate once a day, with or without food. Keep amlodipine besylate away from children. Store amlodipine besylate tablets at room temperature (between 59° and 86°F). Keep amlodipine besylate out of the light. Do not store in the bathroom. Keep amlodipine besylate in a dry place. You can ask your pharmacist or doctor for information about amlodipine besylate, or you can visit the Amneal website at www.amneal.com or call 1-877-835-5472.